Natural agate edged with 18-kt. gold plating. Size, shape, and color of stone will vary. Set of four; each, approximately 5"Dia. Handcrafted coasters. Embossed-shagreen finish. Ringed in brass with suede lining. Set includes four coasters in a circular box. 5"Dia. x 3.5"T; each coaster, 4"Dia. Imported. Coasters have embossed-shagreen finish. Ringed in gold-tone brass. Suede underside. Organized in a round box. Set of four; each, 5"Dia. Coasters have embossed-shagreen finish. Ringed in gold-tone brass. Suede underside. Organized in a round box. Set of four; each, 5"Dia. Packaging, 7"W x 2"D x 4.8"T. Imported. 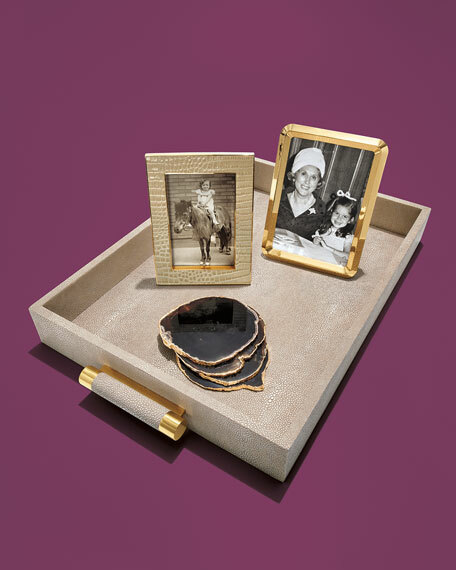 EXCLUSIVELY AT NEIMAN MARCUS Coasters created with hand-layered capiz shells; cork backing protects tabletops. 14"Dia. Wipe hard surfaces clean. Imported. Handcrafted double old-fashioneds. Optic glass and pewter. Hand enameled and hand set with Swarovski?? crystals. Finished in 14-kt. gold. Set of 2; each measures 3.75"Dia. x 4.25"T and holds 11 ounces. Hand wash. Made in the USA of Polish materials.